The MoS Home said this while referring to states like J&K, Assam and Nagaland where the controversial Act is in force. NEW DELHI: Days after the Centre completely removed the Armed Forces (Special Powers) Act (AFSPA) from Meghalaya and partly restricted it in Arunachal Pradesh, it emerged on Sunday that the Act may be removed from other states like J&K, Assam and Nagaland if the situation improves. The indication in this regard came from Union Minister and MoS (Home) Kiren Rijiju who said that the AFSPA, which gives special powers to security forces operating in conflict zones, may be withdrawn from areas where security situation improves. Referring to the situation in Nagaland, Rijiju said that the ongoing Naga peace talks between the NSCN-IM and the government's interlocutor were being followed up with utmost sincerity and the outcome of the dialogue would be positive. He, however, refused to give any time-frame for the signing of the peace pact. "Since the security scenario in the Northeast has improved in the last four years, AFSPA has been removed from many areas. We are hopeful that with further improvement, it may be lifted from the remaining few areas in the near future, '' he was quoted as saying by PTI. “The process of Naga talks are being followed up with utmost sincerity. So the outcome will be positive,'' Rijiju assured. A framework agreement was signed on August 3, 2015 by NSCN-IM general secretary Thuingaleng Muivah and the government's interlocutor R N Ravi in the presence of Prime Minister Narendra Modi. The framework agreement had come after over 80 rounds of negotiations spanning 18 years, with the first breakthrough made in 1997 when the ceasefire agreement was sealed after decades of insurgency in Nagaland which started soon after India's Independence in 1947. The remarks from MoS Home came days after the Centre government completely removed the Armed Forces (Special Powers) Act from Meghalaya and partly from Arunachal Pradesh. 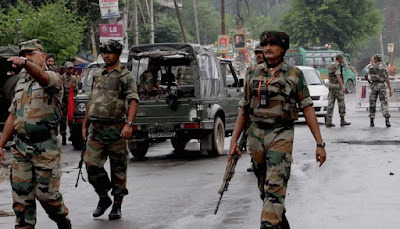 ''Union Home Ministry has removed Armed Forces (Special Powers) Act (AFSPA) from Meghalaya and reduced it to eight police stations in Arunachal Pradesh, a senior Home Ministry official said on Monday. "AFSPA was totally withdrawn from all areas of Meghalaya from April 1. In Arunachal, it is down from 16 police stations to eight," the official added. Though removed from almost all of Meghalaya, the AFSPA has been extended by another six months in three eastern districts of Arunachal Pradesh - Tirap, Longding and Changlang. These three eastern districts of Arunachal Pradesh share the border with Myanmar and some specific areas under eight police stations in seven other districts bordering Assam. The three districts have been under the AFSPA since January 2016. ''The decision to remove AFSPA from Meghalaya and parts of Arunachal Pradesh was taken due to significant improvement of security situation in the two states,'' the Home Ministry official was quoted as saying by PTI. The controversial law, AFSPA, which empowers security forces to conduct operations, arrest anyone anywhere without prior notice, is also in force in Jammu and Kashmir. There have been demands in the Northeast as well as in Jammu and Kashmir that the AFSPA be withdrawn completely as the security forces often allegedly use it whenever there is complaints of human rights violation and use of extreme force.